Call your doctor immediately if you experience any of these symptoms. Terazosin is used to treat men with symptoms of prostate enlargement such as: benign prostatic hyperplasia. These symptoms include troubled or painful urination, as well as frequent and urgent urination. Terazosin can also be used to treat high blood pressure in men. 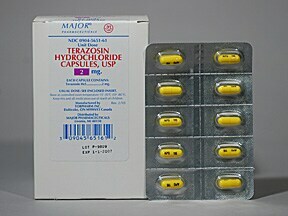 Terazosin is in a class of medication known as alpha-blockers. The symptoms of benign prostatic hyperplasia are treated through relaxing the muscles in the prostate or bladder. It also relaxes blood vessels, enabling blood to flow easily, thus decreasing high blood pressure. Ask your doctor what dosage is right for you. Never take more than the prescribed amount.